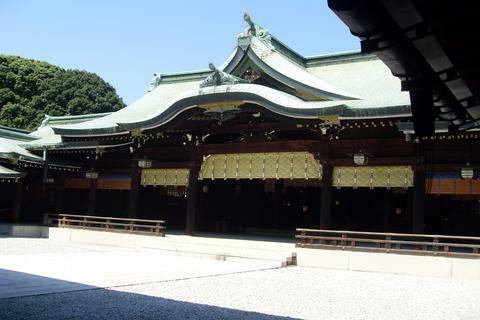 The Meiji Shrine (Meiji Jingu), located in Tokyo, is a Shinto shrine (jinja) dedicated to the souls of Emperor Mutsuhito and his wife, Empress Shoken. Emperor Meiji died in 1912 and his wife in 1914. The sanctuary was built in their honor; the works began in 1915, directed by the architect Ito Chuta, and the sanctuary was inaugurated and consecrated in 1920. The completion of the works dates back to the following year, 1921. After the original building was destroyed during the Second World War , the current sanctuary was completed in October 1958. The territory occupied by the sanctuary is divided into two zones: Naien, or main garden, is the area with the sacred buildings and also includes a museum where objects belonging to the Meiji emperor are preserved and to Empress Shōken. The museum is built in Azekurazukuri style. Gaien, or outside garden, which includes the Meiji gallery of paintings, a collection of eighty illustrations depicting key events in the life of the emperor and his wife. In Gaien there are also various sports attractions such as the national stadium, which make it one of the most important sports centers in Japan. Another important place is the Meiji Memorial Hall, originally used as a venue for government meetings. Today it is used to celebrate Shinto weddings. The areas are covered by an evergreen forest of 120,000 trees belonging to 365 different species, donated by the Japanese people when the sanctuary was built. This 700,000-square-meter forest in the heart of Tokyo is visited daily as both a sacred and meditative place and a recreation area. The sanctuary is built on an area where the emperor and empress Meiji used to go. The structures are essentially made of Japanese cypress wood from Kiso and are built according to the Nagarezukuri style. A large crowd rallies every year at the temple on the 3rd of November, on the occasion of the Culture Festival. Women and children participate in it wearing traditional kimonos. There are exhibitions of chrysanthemums, weddings are celebrated, and the ancient Yabusame rite (archery tournament on horseback) is renewed in the park.